I’ve been organizing some old photos from our 2011 trip to the National Parks in the Southwest. One of the great surprises of this trip was Big Bend National Park. It may be a one of the lessor-known parks, but we loved everything about it… the smells, the silence, the window views, the wide-open spaces, the hot springs, and of course, the one and only, Ranger Dan. But what we loved most? Playing in the mud!! Our hike along the Santa Elena Canyon trail on the banks of the Rio Grande started off ordinary enough. But then the magic happened. 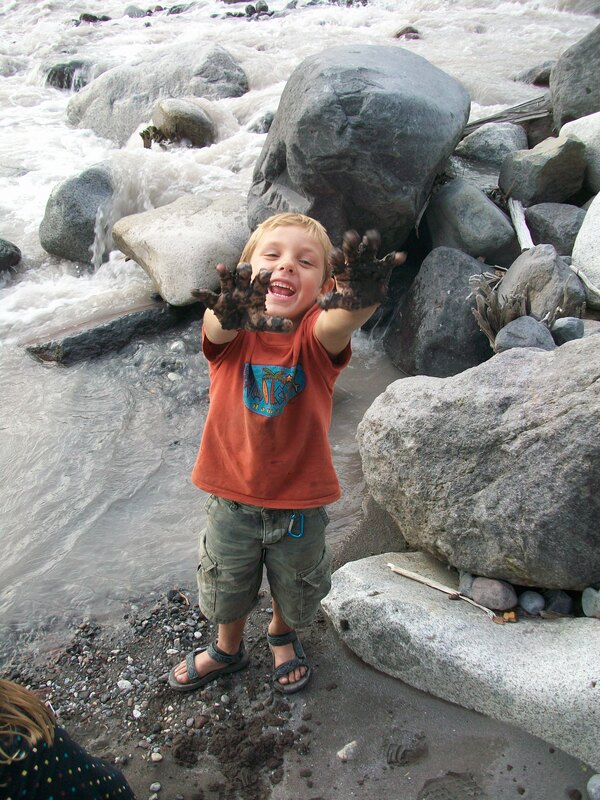 The magic of what kids do when they have the freedom to just… be kids. They discovered a particularly muddy bank next to the rock face and the antics began: the chasing, the swimming, the slipping, the climbing, the laughing, the playing. Even my 13 year old daughter had a blast with her younger siblings. And when we climbed out of that particular section of the trail, into the wide-open mud-flats along the river, they were actually crawling their way across the bank on their hands and knees, playing mud monsters. I thought at first the well-dressed Japanese tourists were shunning me and my parenting methods as they watched my children crawl their way back to the car caked in mud from head to toe, but soon enough one of them pulled out his video camera and started recording their hilarious progress. We were all, adults and children, Japanese and American, sharing the laugh together. I will never, ever, ever forget that day. What is one of your favorite National Park moments? We have a Mountain to Climb! 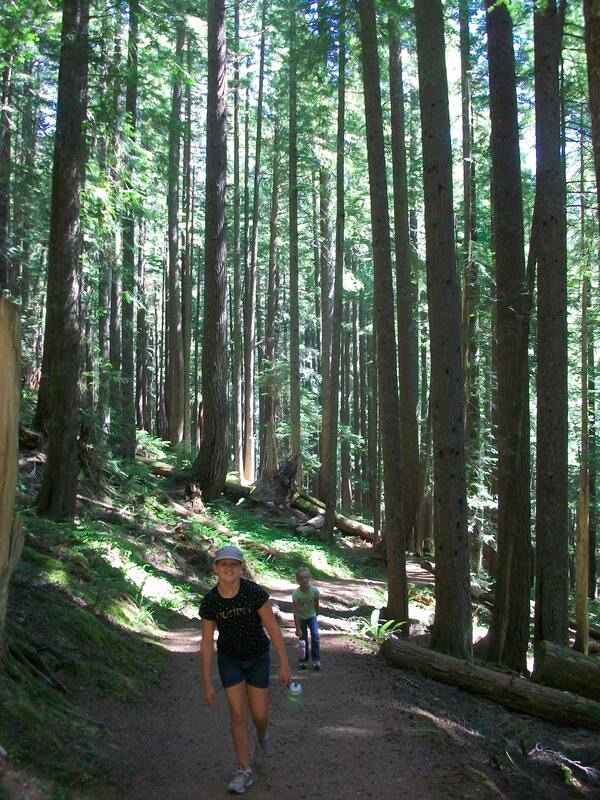 I’m sure your kids have never complained about going for a hike in the woods, but mine do.. every single time. So why all the hiking? By now you might have noticed that most of my itineraries are centered around us doing a hike or five wherever we go. 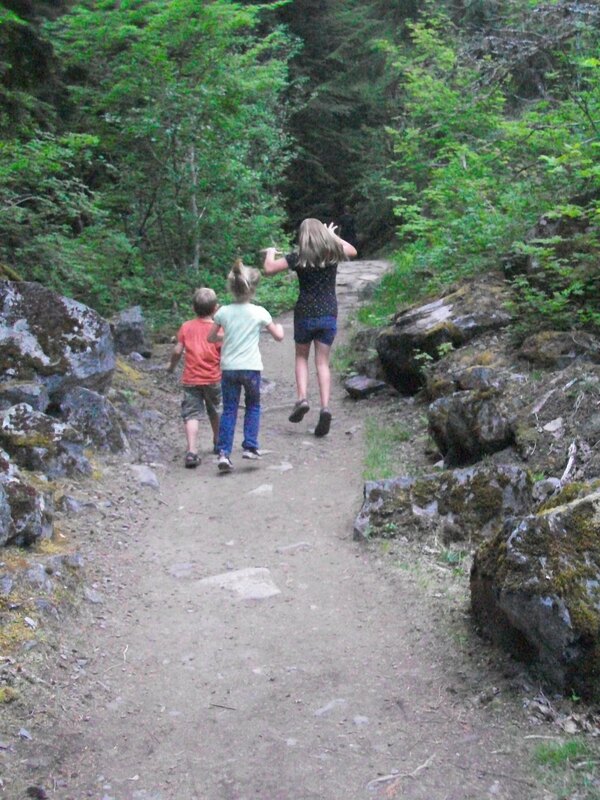 However, I’ve learned the most important secret in the history secrets to hiking with kids. Are your ready? Here it is. Once they are on the trail, they will stop complaining. Every. Single. Time. It’s all in the presentation of the task. Kid’s love stories of superhuman hero’s and great epic journey’s. They watch characters overcome incredible odds in their favorite movies. Giving them the opportunity to accomplish their own great adventure, will not only inspire them to greatness, but will allow them the freedom to enjoy it without judgment. 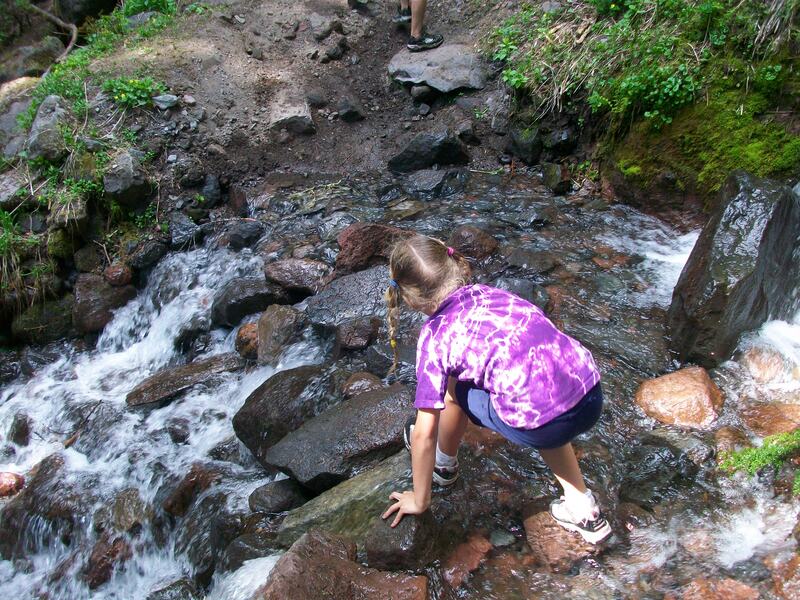 They will create games, splash in the creeks, play in the mud, climb on the trees, and sometimes even stare in awe at the views. And they will return stronger, more confident, and with a more adventurous spirit, ready to take on the next of life challenges. Let’s talk about Mt. 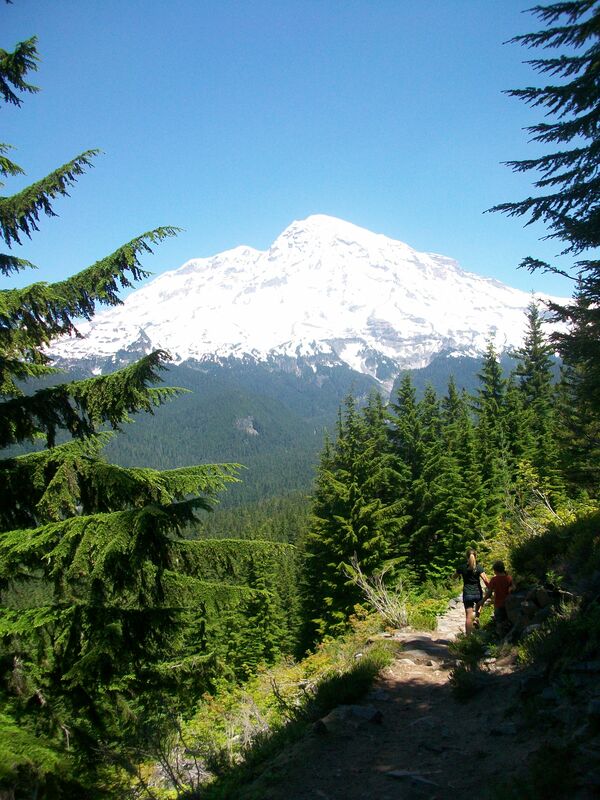 Rainier, one of my most favorite National Parks. Why? The hiking. The woods. The smells. The views. Everything is beautiful here, the hikes are challenging, and there is just so much to see and do! We camped at the lovely Cougar Rock campground for three nights which gave us time for two very full days of exploring. 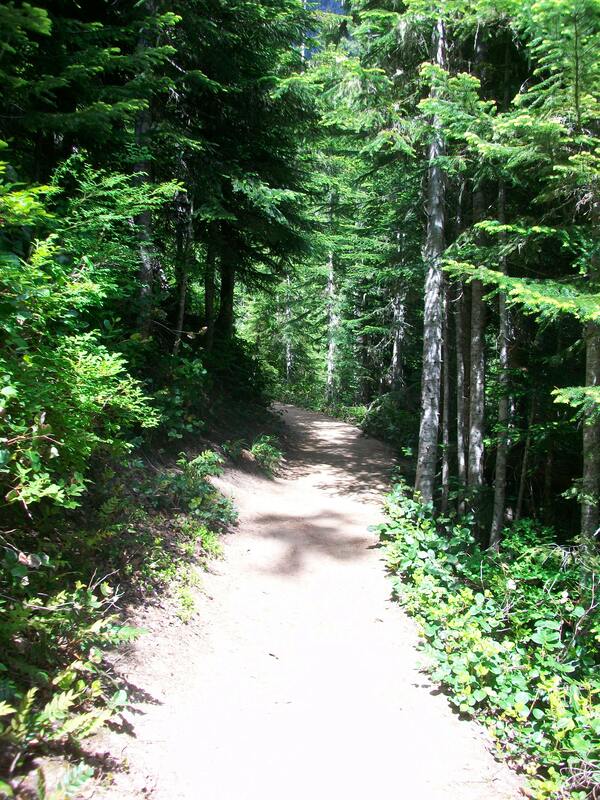 We kicked off our first day with the challenging Rampart Ridge Trail, a steep 4.6 mile loop! 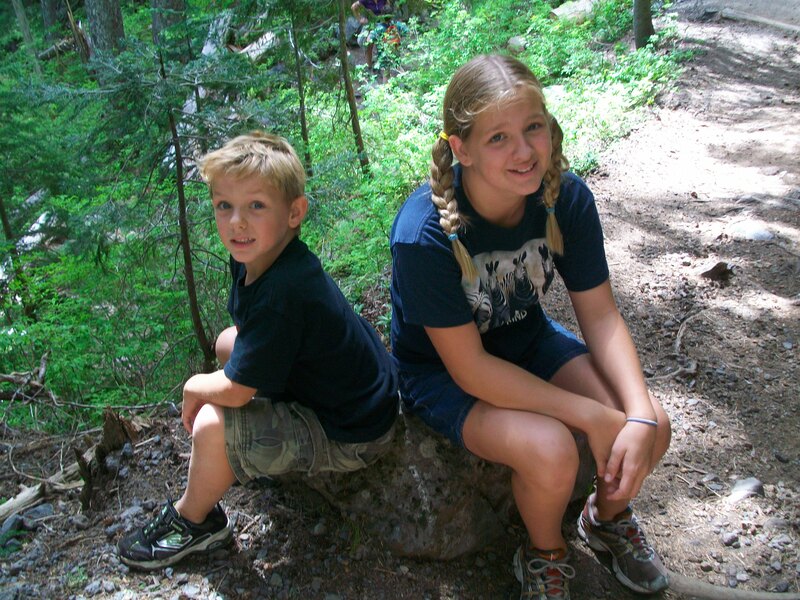 Though the twins were only six at the time, they not only hiked up the endless switchbacks, but climbed on trees, dunked their heads in running streams, raced to the top, and made up silly games along the way. Everyone completed the grueling uphill portion of the hike, we had fun doing it, and at the top we were rewarded with this priceless view of Mt. Rainier! 2010, Mt. 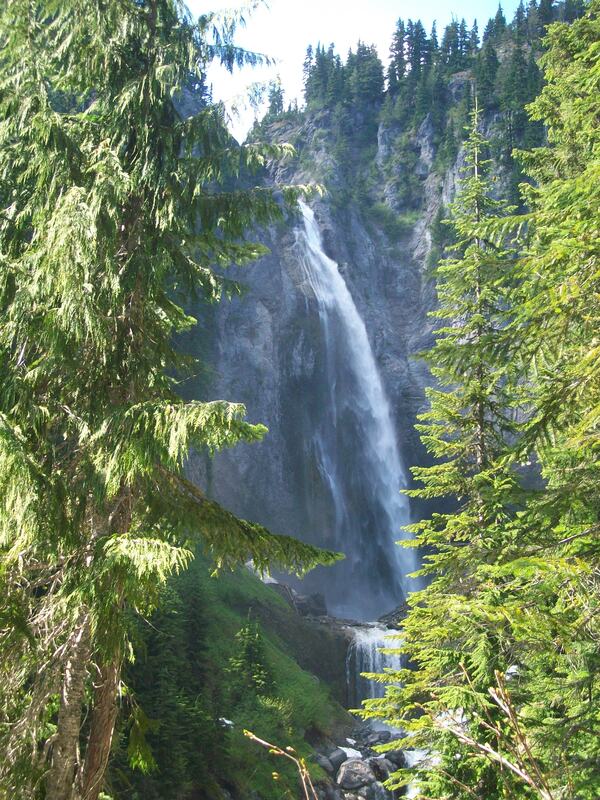 Rainier National Park – Fun on the trail. Fun on the river. We began Day 2 at the visitor center in Paradise. The paradise area of the park is well.. paradise. It was still covered in snow in July, so we especially enjoyed the cozy visitor center while we explored all the exhibits and learned more about Mt. Rainer. 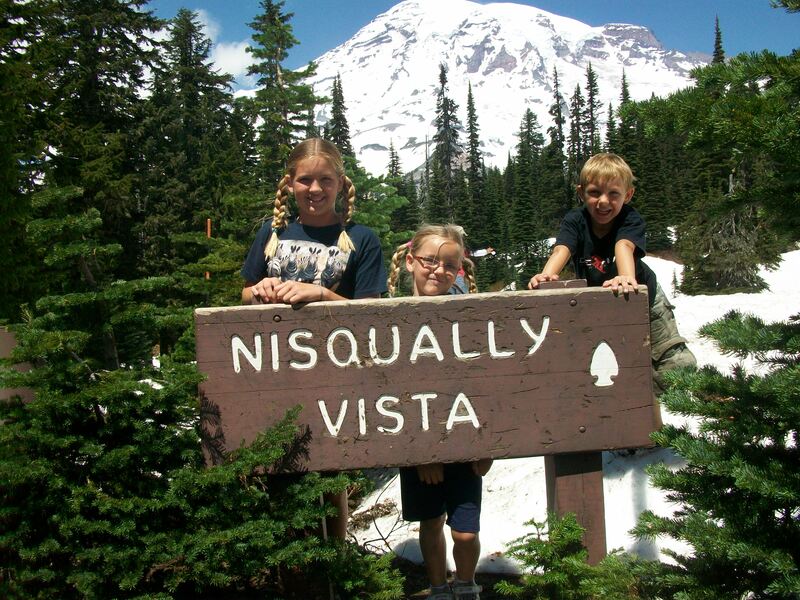 Our first hike of the day was the Nisqually Vista Trail, a 1.2 mile loop through some of the most breathtaking scenery in the park. Although the hike was fairly short, it was exhausting trampling through more than a mile of snow! And once again, although the kids were less than enthusiastic about a morning hike, once they were on the trail they had a lot of fun. I mean, it’s snow! Kids love snow. After lunch in Paradise, I overheard some strange mutterings of “No more hiking mom!” but I assumed they were somebody else’s children and we rode the Mt. Rainier Shuttle bus to our last hike in the park. Comet Falls. 320 feet of breathtaking splendor! 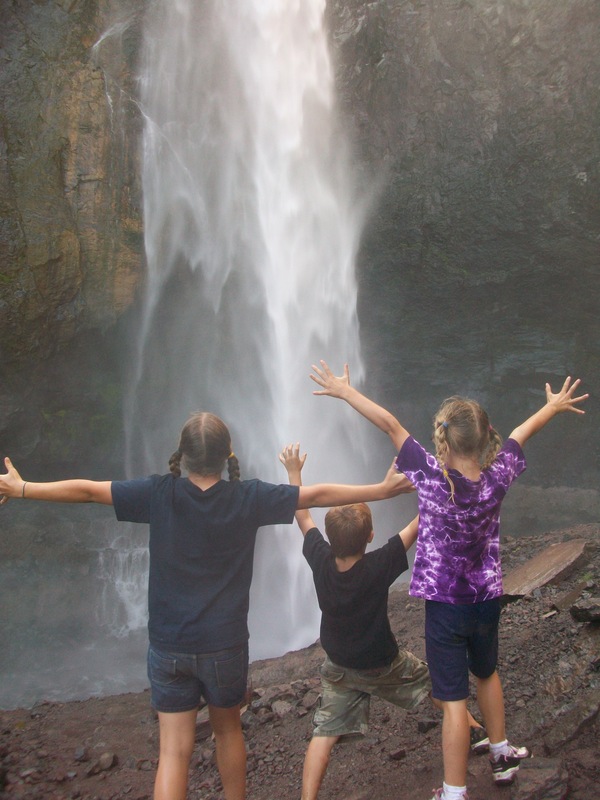 The trail was only about a 4 mile round trip loop, but the hike to the Falls is a strenuous and steady 1.8 mile uphill trek, and half-way through a thirty day camping trip, not to mention spending the last couple days on the trails, the kids were a wee bit exhausted. Once again, they approached the trailhead with all the exuberance of turkey’s on Thanksgiving. Shocker. I have to give them credit though; this time they came up with a whole host of alternative activities, but in the end what were my options? Let them spend this beautiful afternoon in the wilderness sleeping in a tent? No Way. I found ways to get them laughing at me instead of dwelling on thoughts of quitting, and before they knew it, we were a quarter mile into the trail, they were resigned to finishing the hike, and suddenly they were just enjoying the simplicity of the moments, as children do. 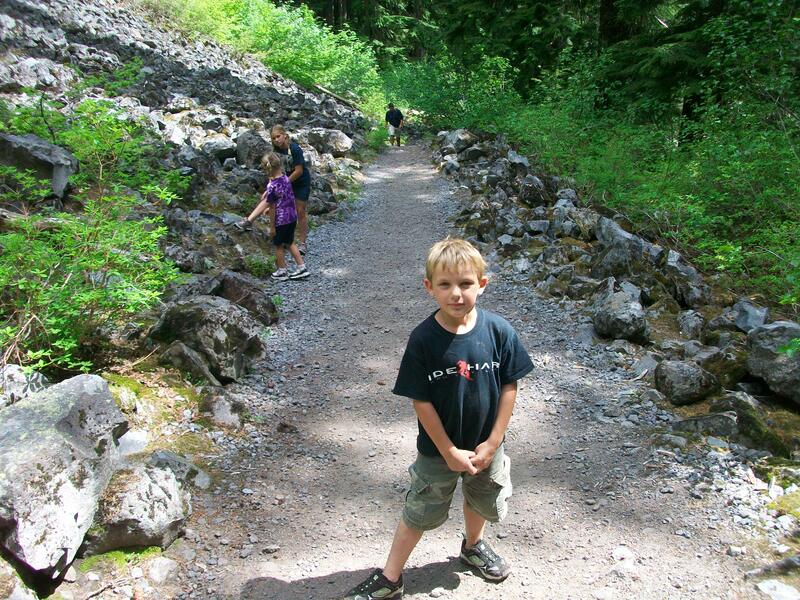 Our path to greatness… setting out for Comet Falls. Our first incredible glimpse of the plunging Comet Falls. We made it! Standing at the base of the falls we could feel the pounding water through our feet, the powerful spray on our face, and the thrill of accomplishment running from head to toe. Amazing. If the kids had given up before we even started, they would have missed this single irreplaceable moment. This moment to learn that the most rewarding things in life, are often the most challenging. It’s not something that can be learned through words; it has to be experienced. I will never, ever forget that day. The smiles on their faces. The adrenaline that returned them swiftly back to the trailhead. The laughter on the way home. And for this reason, Mt. Rainier will always be one of my most favorite of all National Parks. 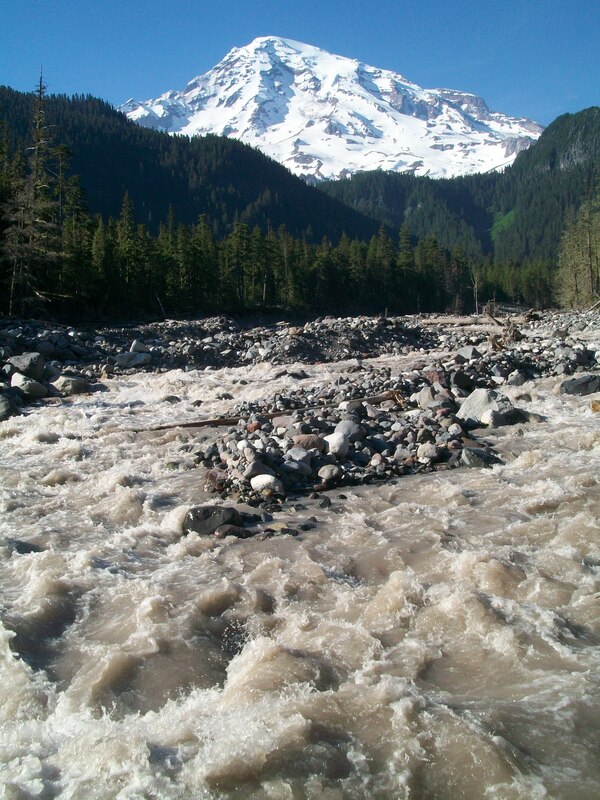 Posted on November 2, 2013 February 13, 2016 Categories NorthwestTags Camping, Comet Falls, Family, Hiking, Mount Rainier, Mount Rainier National Park, Nisqually Glacier, Nisqually River, Road Trip, Travel, Visitor center, Wonderland Trail4 Comments on We have a Mountain to Climb!